He has a notable tattoo. VISTA (CNS) - Law enforcement Wednesday asked for the public's help in finding a suspect wanted in connection with a series of break-ins and attempted break-ins over the past month. Between Oct. 25 and Nov. 20, the same man is believed to have targeted five businesses in Vista -- sometimes successfully, sometimes not -- in seven separate incidents, according to San Diego County Crime Stoppers. The businesses were Tabacinic Chabad Jewish Center at 1930 Sunset Drive; Tiki Mobile Village at 1333 Olive Ave; Maximum Recycling at 430 Olive Ave; and Wholesale Sports Inc. and Get Air Vista, both located at 2755 Dos Aarons Way. The man is suspected of stealing a total of $1,500 in cash, a $350 iPad and a carved tiki stump valued at about $60, in addition to causing about $6,000 worth of damages, investigators said. He was described as white or Hispanic, about 5-feet-8 to 5-feet-11, with a thin build and a distinct tattoo on his left forearm. 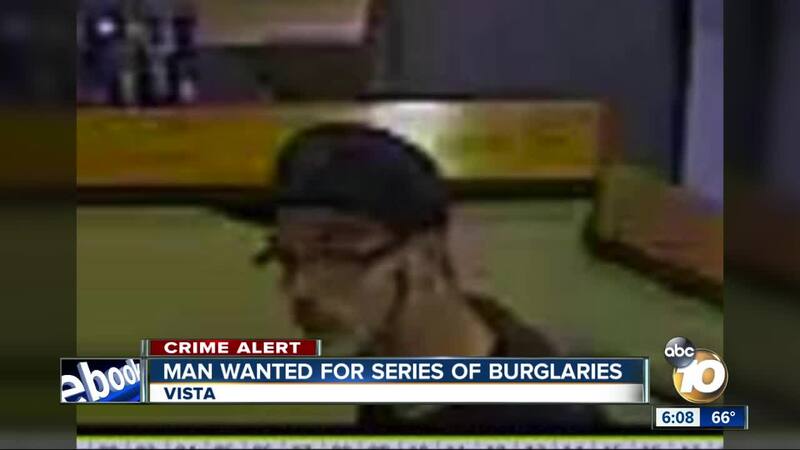 He usually wears glasses and a flat-billed cap, Crime Stoppers officials said. The suspect used the same break-in method in each of the incidents, using a tool to try to pry open the front door of businesses or vending machines, then burglarizing the business or taking money from the machines, authorities said. Anyone with information was asked to call the San Diego County Sheriff's Department Vista Station at (760) 940-4551 or the Crime Stoppers anonymous tip line at (888) 580-8477.